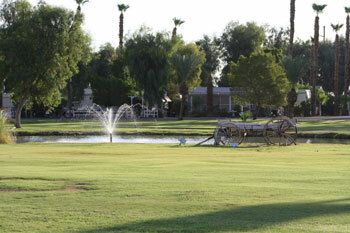 Desert Trails RV Park & Golf Course is a 404 site RV park that is located around a 9-hole executive golf course with four lakes and is open year round. We have the only lighted driving range in the Imperial Valley which is open till 10:00 PM daily. Located in the Pro-Shop we have a snack bar with beer & wine sales, golf supplies and club rentals. The golf course offers a wide variety of golf memberships. We also offer punch cards for golf and for the driving range. Golf carts are available for rent or you can pay trails fees and use your own cart. We offer league golf Tuesday thru Friday from the first of November thru March. We have many other amenities which include a 30' x 60' heated pool, 3500 gallon hot tub, pickleball courts, horseshoes, shuffleboard court and billiard room. During the winter months we offer a wide variety of activities such as crafts, art & paint classes, quilting, Bunco, card games, bingo, water volleyball, water aerobics and exercise classes to name a few. We also have a non-denominational church service every Sunday. Public restrooms are located in five areas throughout the park with showers located in three of those areas. There are two laundry facilities with eight washers & dryers in each. 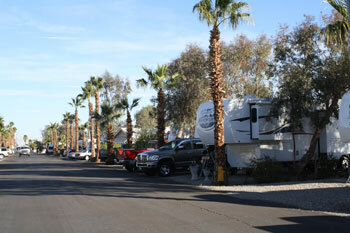 Desert Trails RV Park & Golf Course is a wonderful place to visit and make new friends. Our staff is always there to help make your stay enjoyable. We hope that you will come and stay with us very soon.